Even after all that, his prison buddy promised to remember Joseph after he got out of jail…and then totally forgot about him. It wasn’t until TWO YEARS later that the guy remembered his promise to Joseph. How would we respond if all of that happened to us? Genesis 39:40 says that Joseph continued to do what was right. In every trial, we have a choice. After all this was over and Joseph’s life wasn’t quite so horrible, he gave his son a name that means “God has made me fruitful in the land of my affliction.” He wasn’t exaggerating, his whole experience in Egypt was filled with affliction from the day he arrived as a slave. And yet he saw fruit – growth and goodness – from his life of trials. Here are two things that I took away from the story. #1 -Most of the time during a trial, I’m either trying to think of a way to get out of the trial or I’m just trying to make it through the day. 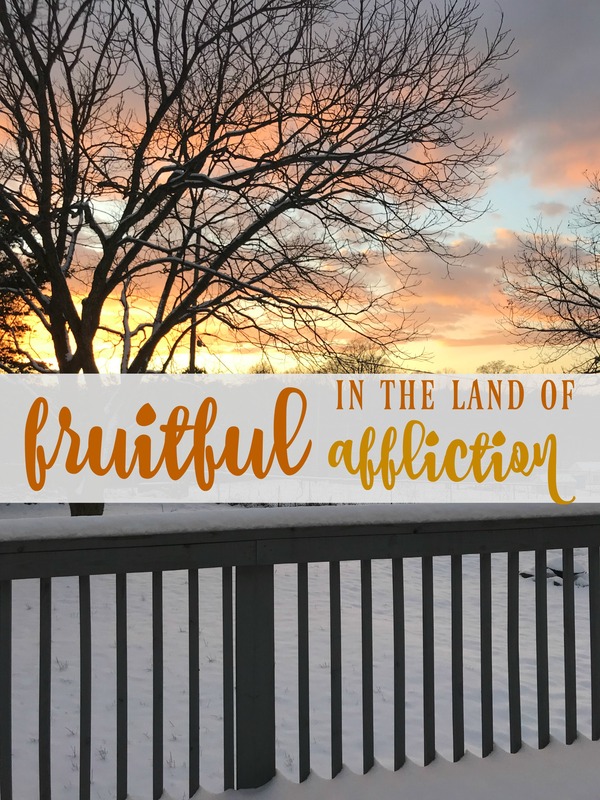 The idea of being “fruitful in the land of my affliction” really stuck with me. I’ve learned that life is not just an exercise in making myself as comfortable as possible. Life is about becoming like Jesus Christ through whatever situation I’m facing. I don’t want to just survive trials, I want to grow through them! The goal of being fruitful in the midst of trials is something I want to pray for myself and for others. It’s a powerful thing to ask God to do instead of just praying, “Lord, help her with her cancer/divorce/grief.” Asking God to make me – or my loved ones – fruitful in affliction gives hope and power to my prayer! Romans 8:28-30 And we know that for those who love God, all things work together for good to those who are called according to His purpose…to be conformed to the image of His Son. Ephesians 3:20-21 Now to Him who is able to do far more abundantly that all that we ask or think, according to the power at work within us, to Him be the glory! #2 – The other thing I love about this truth is that it means I don’t have to wait until the trial is over before I have something to share with others. If I’m fruitful IN the land of my affliction, I can encourage others even while the trial is raging! God doesn’t waste suffering and I don’t want to either. If you are suffering in what seems to be an Egypt-like land of affliction, you’re not alone. God brings these seasons into our lives to help us grow and to allow us to experience His all-sufficient grace. And while we’re talking about trials, you can pray that I’ll be fruitful in affliction! Our HVAC died this month…and here in South Carolina we can’t really live without air conditioning. LOL. We’re working towards getting it fixed – and trusting the Lord for His provision. I’m not a stranger to financial needs and I’m very thankful for the many times God has provided for us in the past. He is able! So glad you have your AC situation under control again! Trials can be great teachers, if we can handle the frustration. Way a testimony Joseph has! I, too, want to problem solve and expedite troubles away so his story is a good reminder for me. I’m sorry about your HVAC drama. That’s an expensive repair and an inconvenience. Praying your find some affordable options because AC is definitely a must have. Thank you for praying for me, Cari! We have AC again and it is such a blessing! Yes, AC has become essential in the south. I grew up without it and as much as I can remember it could be miserable. Especially trying to sleep when it was so hot. Praying everything works out for you! !